I got the opportunity to instruct for Xtreme Xperience (xtremexperience.com) on September 29 and 30 at Pacific Raceways. The company has 21 supercars: Ferrari 458 and 488s, Lamborghini Hurucans, Porsche GT3s, Audi RS8s, and Nissan GTRs that the haul around to tracks across the country. People purchase the opportunity to drive these cars for three laps at Pacific Raceways or another race track. Xtreme Xperience hires experienced local instructors. The philosophy of the company is to maximize customer experience while safely driving a very expensive supercar on the racetrackvery fast. An instructor is in the car at all times and the entire experience is recorded with really cool telemetry for the driver to purchase later. Over three days, there were over one thousand drivers who came out for this experience. Many were given the experience as a birthday or anniversary gift or just want to do something really cool for themselves. Drivers ranged from experienced hot shoes to just everyday people who love fast cars. Families came out to see dad, grandpa, or mom drive on the track. I understand that there was one engagement that took place at the event, which is not uncommon for Xtreme. The short patter at the beginning of this paragraph is the in-car instruction each driver received after a short classroom session. For those of you who have experienced HPDE days, you might notice a difference! How then do you get a driver to control a very fast and expensive car on the racetrack who has never been in a fast car or on a racetrack? It is accomplished by having a lot of experience in the right seat during HPDE days and with some great coaching from my mentor Josh Jenny, a lead instructor from Pennsylvania. Each new instructor is sent a very complete packet on the rules and philosophy of Xtreme Xperience. We went over the expectations for day, his method of driver control, and the speech. The speech is the beginning of this article is one that is used by most of the instructors. There is no dead air in the cockpit, lots of direction, precise instructions on when and where to turn, and being keenly aware of potential problems so that they do not materialize! My two days were simply enlightening! I have never been so exhausted at the end of a day, not even when I have been instructing with the BMW club. A new driver appeared in the car about every ten minutes and back out we went. This program is organized and run by several lead instructors with amazing proficiency and maturity. Cal DeNyse was in charge for this event. A young guy, but mature, professional, and organized beyond his years. All instructors and event workers have two goals in mind: maximizing the customer’s experience and making sure all drivers are completely safe. I was so impressed with the comradery of the group and how they embraced me as the new guy. I told Cal during my phone interview process, that I had two reasons for wanting to instruct for Xtreme: one to learn something completely new and secondly to steal their methods to bring back to the BMW club. He laughed but understood it. For those instructors who might be getting complacent doing the same thing at Pacific or the Ridge, try something new. Offer to instruct for other clubs: Audi, Porsche, Hooked on Driving. The more experiences you have the larger the tool box is of skills. As instructors, we need to keep learning. I spoke with Ross Bentley about this experience. 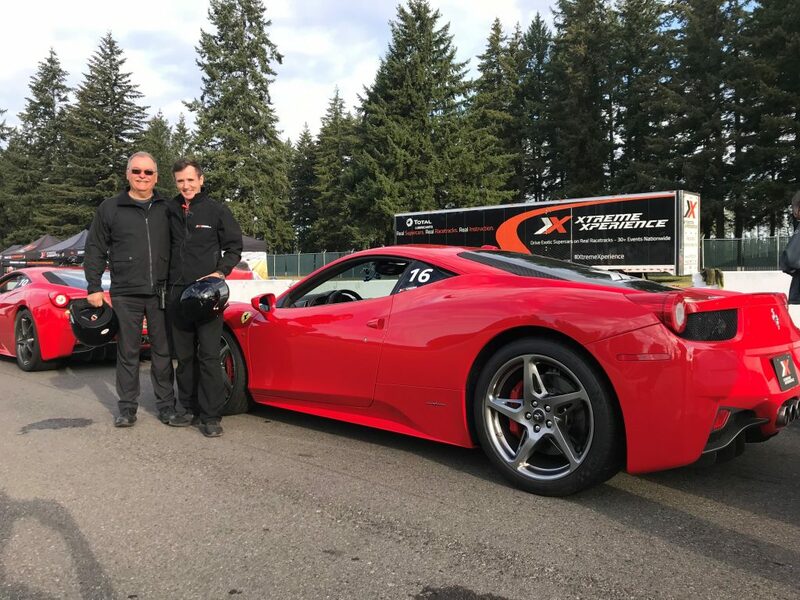 His reaction was “great, we all need new skills in the tool box.” Next year on September 20-22, Xtreme Xperience is coming back to Pacific Raceways. Yes, as an instructor, you will get a chance to drive a super car in the morning for the “morning warmups.” I will be there for the three days, learning more. Make 2019 a year of learning more skills, participate in other club’s programs, and fill your toolbox with skills. It is good for you!